Raps Win, Is Steve the Reason Why? 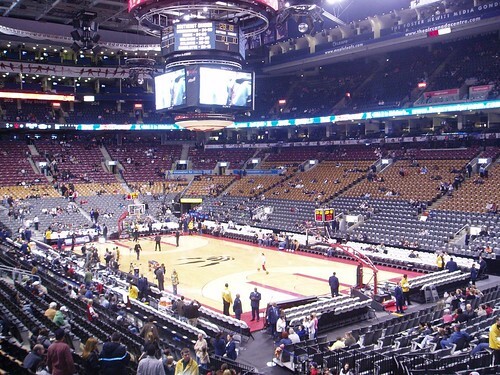 Thanks to my pal Humble, I attended the Toronto Raptors game last night at the ACC. We started sluggish but T.J. Ford made sure we came together in time to dispose of the New York Knicks 104-94. We booed both Isiah Thomas and Steve Francis, but Isiah got it loudest. Isiah Thomas is now 4-9 against us. The Raptors are 23-9 at home, but one of those losses was to Utah back in January while I was courtside. The reason I mention that is because the home teams have stunk up the joint when I've been in attendance. I attended two Argos games last season, and we lost both. I attended a Marlies game and we got skunked. I caught the Leafs and Avs earlier this season and we lost. The only time I attend a winning game is when my brother Steve is in the seat next to me. That's how I got to witness a 4-2 win over the Thrashers in October and last night's Raptor victory. I was there, but you can thank Steve for the big win. Here's a photoset of pictures I took last night at the ACC.